The High Priestess is understanding, receptive clarity, and quiet, yet profound, spiritual conviction. She is the holy feminine, the virginal priestess. She willingly submits to life’s realities, but isn’t confined by the physical. The High Priestess holds the book, the word, the codified explanation to the mysteries of the universe. But unless required, she keeps these secrets to herself. 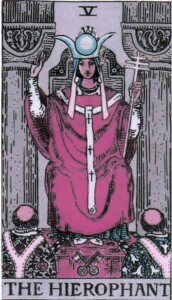 The Hierophant is also a keeper of secrets, mysteries and the word from on high. But he’s actively willing to share. 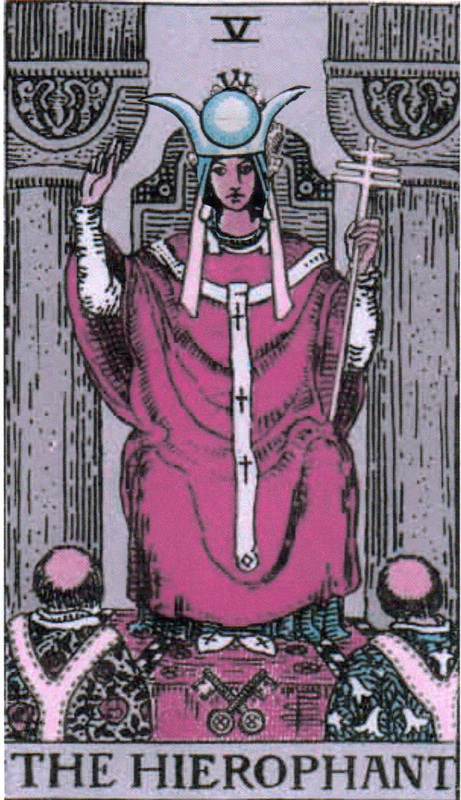 In fact, the Hierophant sees his role as the ambassador of the spirit, the arbiter of truth in its most sublime form. Bring the big questions before him and he will decide. He’s the human connection to the divine. He is Holy Law. The High Priestess feels all right in this position. She might not be so accustomed to making decisions for others, but she’s certainly comfortable in her faith, and in her ability to interpret the law.